As a way to tick off a relative you don't like, you have to admit this is choice. In the 1890s, Mrs. William Astor was the doyenne of New York society. Her nephew, William Waldorf Astor, couldn't stand her. He owned the property that was adjacent to hers—essentially her back yard—and that gave him an idea: Build a hotel, they will come, auntie will go. William won that round; Mrs. Astor moved uptown. And that's how the original Waldorf at 5th and 33rd (where the Empire State is now) came to be. Mrs. Astor's son, John Jacob Astor IV, also loathed William but couldn't fail to notice the Waldorf's success. So he negotiated with him to build another hotel on his mother's former plot of land. 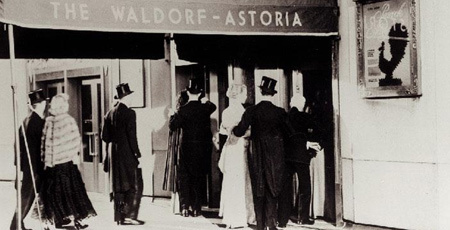 It made sense, all parties realized, to make the Waldorf and the Astoria one hotel, but not without an escape clause. John Jacob and Mother Astor insisted on a provision in the contract that the two hotels maintain at least 30" of air space between them. Either party could choose to seal up the space and break off into a separate hotel if the need should arise, which fortunately never did. The legacy of these family feuds is found in The Waldorf=Astoria name itself. They've generally used the 'equals' sign instead of a hyphen between the two names as a way of maintaining the equality of the two conjoined properties. The hotel had made its plans to move to the current, larger uptown site and had completed the financing days before the Crash. Nevertheless, the new Waldorf=Astoria opened on October 1, 1931 in all its Deco splendor. If you count its original incarnation, the hotel is 119 years old this month—an impressive run for a grudge match.